Anyone who's lived in a college town is intimately familiar with the street solicitors for non-profit. You know the ones, the foot soldiers of the World Wildlife Foundation and countless other organizations, the confront strangers in hope of getting donations or at least an email address. Other than pamphleteers, they are the lowest level of strategy to achieve political motivation in-person. What is the logic behind soliciting donations in the street? Above all else, making eye contact, in this day and age, is a disruptive act. You might be out shopping or picking up groceries, and suddenly you are physically confronted with a political issue. Even if, like most people, you ignore the solicitors and walk away, the seed is planted, the issue remains. Enjoy your smoothie, but by the way, the Sumatran Tiger is nearly extinct. 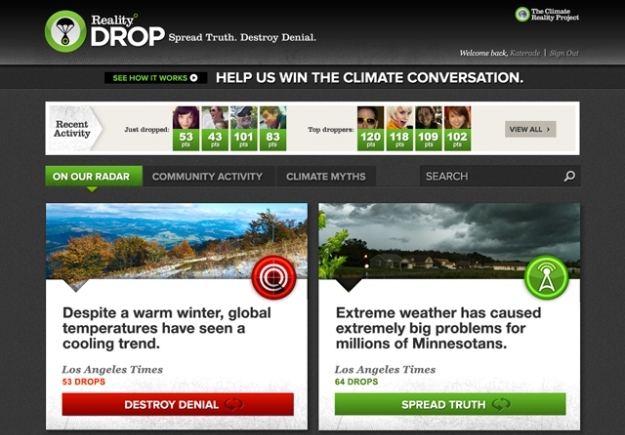 Al Gore, in his capacity as an environmentalist advocate, has recently launched Reality Drop, an internet tool and project that "gamifies" climate change conversations by creating online "street soliciters". To play, users copy environmentalist responses and paste them into the comments sections of articles about climate change. See someone denying anthropogenic climate change? Just share a tweet-sized response and you climb the social ladder of Reality Drop. While I personally find the implementation of game-like motivation elements deplorable, counter-productive, and forced, I understand the motivation behind these efforts. Issue organizations have long struggled to maintain relevancy and the attention of the public. In fact, the project isn't all bad. It does include valuable resources and aggregates relevant news articles. Like street petitioners, Reality Drop tries to inject an issue into public conscious using games. Of course this isn't the only attempt at connecting games with some form of political mobilization. Even the recent NASA hosted Dark Side Game jam will use the game products made at the event as public relations tools for the association. Again, this isn't a bad thing per se, but is becoming common. When it comes to political mobilization, everything is an act of desperation. Cold-calling district citizens or having poorly-paid students corner strangers in hopes of a twenty dollar donation might not be glamorous, but it can be effective. Gamification is no different. The methods have changed, but the strategies and motivations are the same. How do organizations, many with too few resources as it is, capitalize on games? They make mistakes, a lot of them, churn out terrible games, abuse gamification, and they learn. I can't blame people for trying.